On An Overgrown Path: Contemporary music's Grand Canyon Suite? 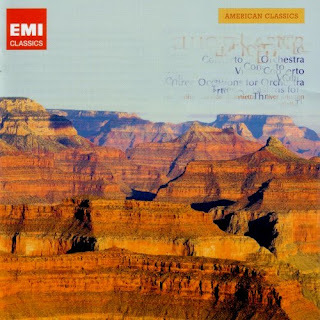 Contemporary music's Grand Canyon Suite? Glance at the retouched CD sleeve above from EMI's new budget priced American Classics series. What is the music? - Grofé's Grand Canyon Suite or, perhaps, Copland's Rodeo or Billy the Kid? No, as the original sleeve below shows, it is three masterpieces from that most cerebral of composers, Elliott Carter. The marketing trick of 'every cover picture tells a different story to the music' has been around since the dawn of the LP age. It continues today, in the twilight of the CD era, with, for example, the excellent Warner Apex budget reissues of Boulez resorting to soft focus library images of flowers. But if the cover image doesn't affect sales why not use typography, as HatHut do with their [now]Art label? And if it does affect sales why couple an easy on the eye photo of the Grand Canyon with an excellent CD containing what a perceptive sleeve note by Martin Cotton calls 'a tough listen'. 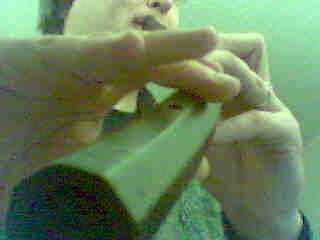 Connecting with new audiences for contemporary music is quite rightly a pre-occupation on the blogs and elsewhere. But how many floating listeners will buy this £8 CD expecting to hear contemporary music's Grand Canyon Suite, only to feel misled by the visual 'recommendation'? Isn't it better to manage expectations than flatter to deceive? In today's credit crunch markets cost is the excuse that covers all manner of sins. Yes, library images are cheap. But so is the creative use of typography or royalty free deals (as are used so aggressively by the record companies for the music itself) with ambitious young artists and photographers. Independent label Soli deo Gloria shows how it can be done with their attention-grabbing covers using the powerful photos of Steve McCurry. Surely a new series celebrating the music of America, that most graphic of countries, just cries out for contemporary graphics? Coverless MP3 downloads may be the new wave, but not yet in the budget market where these American Classics CDs are over-the-counter impulse buys. Low priced re-releases like this are an important vehicle for expanding the market for new music, and as Alan Rich explains in his excellent book Music - Mirror of the Arts the visual arts are a powerful tool for making contemporary music accessible. The feeble imagery on this EMI re-issue is the greater pity because the music and performances are so good and the price is so affordable. 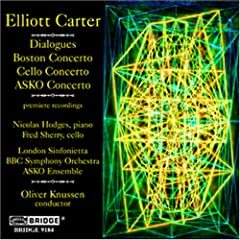 If you don't have Carter's Concerto for Orchestra, Violin Concerto and Ives influenced Three Occasions for Orchestra in your collection this is a 'must buy'. If you have the works but not these performances by Oliver Knussen, the London Sinfonietta and violinist Ole Böhn you are missing something quite special. And the gorgeous sound captured by engineer Tryggvi Tryggvason in Henry Wood Hall and Blackheath Concert Halls in 1992 is confirmation that the fine art of sleeve design may be dead, but the black art of great recorded sound lives on. Now this is what I call great sleeve art. Although there's nothing wrong with a recording firm wanting to emphasize Carter's Americanism, the USA is a rather large place, and associating Carter with the Grand Canyon, rather than something from his own neck of the woods, say, the skyline of Manhattan with all the dynamics and movement of modern urban life which Carter celebrates in his music, is downright odd. Nice one Corey, you have hit the nail on the head. And Arte Nova is a super-budget label. I wonder if anyone at EMI actually listened to the music or researched the composer before designing that CD sleeve? Or this, a work of art from Mr. Carter's own collection, I believe. I agree, the Concerto for Orchestra is the least Grand-Canoyony music I can think of, but it does refer to a natural force, that is, wind. The cover of the original contained several photos of clouds, arranged as a collage, and it did capture somewhat the impression created by the music. On the other hand, sometimes the incongruous juxtapositions do work. One of my old Haydn collections on Vanguard has a Jackson Pollack on the cover, and the Mozart disk in the same series has a Paul Klee. They're colorful, and while they have little to do with the music ---aside, perhaps, from suggesting its timelessness --- they make for attractive packages.